July 4, 2010 — Rochester, NY . . . The 2010 “Vince Bruni Preview of Champions” was going to be a major show. Not only would the Empire Statesmen debut their 2010 program, “Going to Oz.” on their home turf, they were supposed to be going up against fellow upstate New York competitors Rochester Crusaders and Syracuse Brigadiers, with a special appearance by the San Francisco Renegades. With both Crusaders and Brigs taking the year off and the trip from California by Team Evil falling through, the Statesmen became the only DCA Open Class corps in the lineup. Fortunately, performances by alumni corps Mighty St. Joe’s, Erie Thunderbirds and Preston Scout House, as well as Class A competitors Kingston Grenadiers and White Sabers, gave fans attending the show plenty of in-your-face drum corps power to talk about. It was the only feeder unit for an all-age corps, the Empire Cadets, that led off the night. Augmented by a few of the younger Empire Statesmen members, themselves former Empire Cadets, the corps may be small in stature, but they were a big hit with the fans. Formed in 1994, the Empire Cadets have given opportunities for both the young members as well as for the instructors from the Statesmen, past and present, who have taught them, to learn about the joys of performing at an early age. Tonight was no exception, as the Cadets gave a fun performance which got the crowd warmed up for the night’s entertainment. Being the only Open Class corps at the show, the Empire Statesmen performed as if the other top three corps were competing against them, throwing down an incredible first show of the season with their “Going to Oz” program. The show hearkens back to Statesmen shows of the late-1990s and early-2000s, telling a story on the field though music, acting, props and, of course, CO2. The snare line is wicked clean for the first weekend of July and the guard is one of the strongest the Statesmen have ever fielded. This is a corps that can give the Reading Buccaneers a run for their money and it will be VERY interesting to see what happens in Lewisburg, PA, in two weeks. The Statesmen weren’t the only corps that announced their intentions to go for the top spot tonight. The Kingston Grenadiers put out an amazing amount of sound with just 16 horns and no contras. The show, titled “Without Warning” and based on “Stormworks” by Stephen Melillo, is a departure for the Grennies, but what hasn’t changed is the aggressive performance level of the corps. On top of the powerful brass performance, the drum line showed itself to be of Open Class quality. The Govenaires will definitely provide competition when DCA rolls around Labor Day weekend. The White Sabers have chosen a very complex theme of Cirque du Soleil music, a show which is a polar opposite from Kingston’s power-laden production. The music requires much in the way of subtlety. Unfortunately, this early in the season it’s difficult for the corps to perform with that level of subtlety, especially when there are only 14 horns on the field. The trumpet soloist does a very fine job throughout, as do the two tubas, who have laid down a strong foundation for the rest of the horn line to build on. This show has a long way to go, however, before it can say what the corps wants it to say, but the White Sabers have the time they need to achieve their goal. Continuing the trend of small horn lines with large sound were the Erie Thunderbirds, with which I had the honor of performing. Offering classic drum corps charts like “Appalachian Spring,” “Battle Hymn” and “Mag 7,” the T-Birds electrified the crowd, showing early on that you don’t need a full horn line to make a statement. The drum line saw the horn line’s energy and raised it to another level, playing cleanly and with intensity. It was a treat to watch the fans as they stood up and cheered, giving back the energy the Thunderbirds played with and setting the tone for the rest of the night. Preston Scout House Bugle Band Alumni made a special trip down to Rochester to perform at the “Preview of Champions” and they came to play. 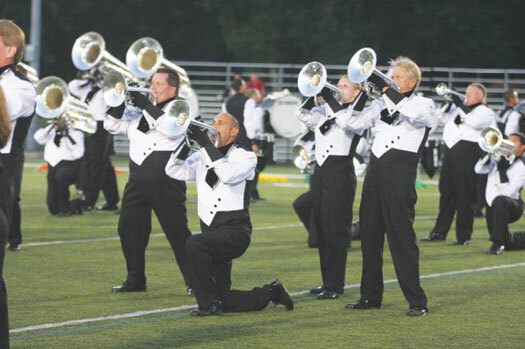 Based on this alumni corps’ performance, the show could have also been called the “Alumni Spectacular Preview” as the corps performed at a level that may have been higher than any previous Rochester Labor Day weekend appearance. The horn line was especially crisp, playing with volume as well as precision, and performing Scout House standards like “Maple Leaf Forever,” “Oklahoma” and “Waltzing Matilda.” The drum line showed the crowd what rudimental drumming was all about, complete with drum-to-drum playing during their solo. The corps can only get better between now and the “Alumni Spectacular” in September and I cannot wait to see and report on their performance then. Mighty St. Joe’s finished the night’s performances with the same level of power and pizzazz that was presented by all the preceding corps. Coming off the line with “Bully” and its signature opening soprano solo, St. Joe’s showed the crowd yet again that you don’t need to be a competing corps to make a splash in the activity. The Chuck Mangione classic “Children of Sanchez” was another highlight of the performance, during which every section had a chance to shine. Another alumni corps to look forward to during Labor Day weekend, Mighty St. Joe’s knows how to bring the crowd to its feet with every performance. Tonight was no exception. You may discuss this review on the DCP Forums. We’d love to hear your feedback. These articles are provided to Drum Corps Planet from Drum Corps World staff members who regularly contribute show reports and feature material for the monthly newspaper. The content is exclusive to Drum Corps Planet and will not appear in issues of DCW. For information about subscribing or to learn about the historic DVDs and CDs that are available, visit the Web site — www.drumcorpsworld.com." The Madison, WI-based Drum Corps World has been published continously since October 1971 — 37 years of service! The tabloid newspaper is mailed monthly and contains articles on competitions and concerts, worldwide event calendars, scores, photography, features, regular columns and advertising from the companies that support the publication and the activity. Our staff of 75 writers and 12 photographers have extensive experience and many have been with us for 10 years or more. In addition, you will also find historic material in the store including: 136 historic CDs originally recorded between 1950 and 1980, vintage DVD content, videotapes, record albums, history books, back issues of DCW and feature articles from past issues posted on the front page twice each week. Visit www.drumcorpsworld.com. For more information, call toll free 1-800-554-9630. Posted by DCP Publisher on Monday, July 26th, 2010. Filed under DCW On-Line.